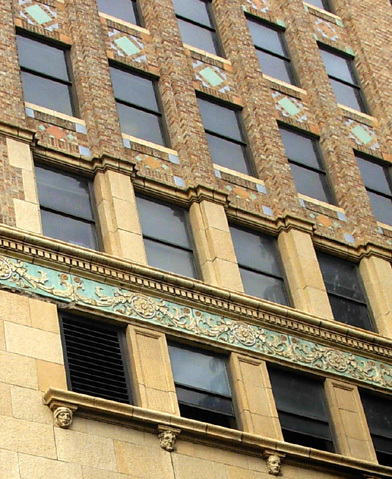 the architectural mix is as varied as periods and materials allowed." 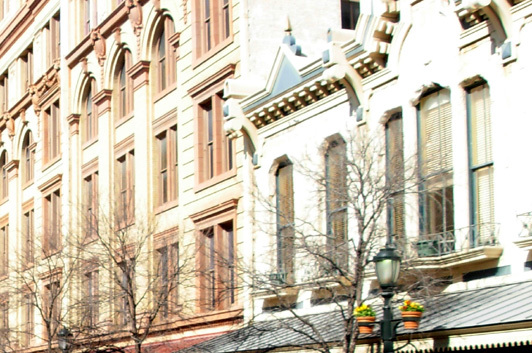 This introduction to San Antonio is a good summary of the appeal of this city's architecture to visitors and residents alike. 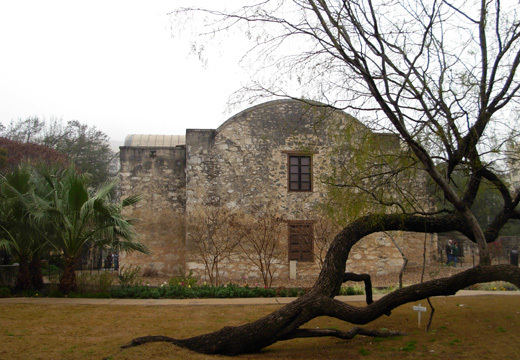 Consider the venerable Spanish mission-turned-garrison, "The Alamo," constructed in 1718 . . . 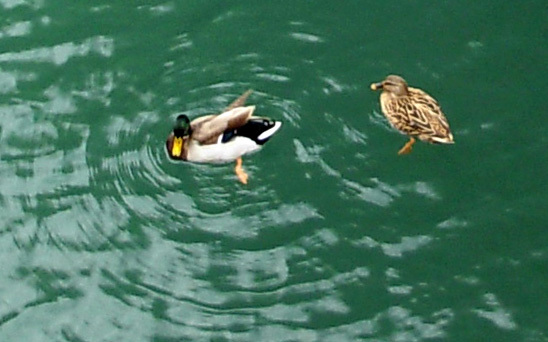 Somehow it all works, although some people may consider it more cacophony than symphony. I happen to like the variety. 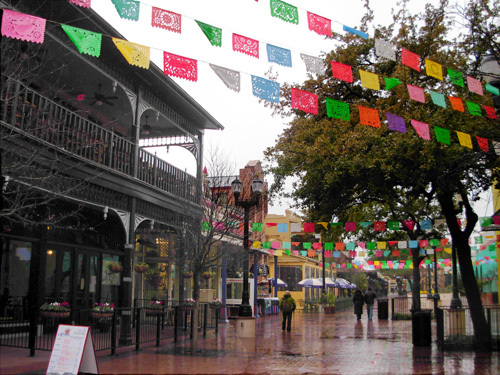 The same mix can be found in its residential neighborhoods, which reflect the influences of Mexico, Spain, England, Germany, Morocco, and more!. First there were the Native American tribes who inhabited the area (Coahuiltecan, Tejan, Apache, Comanche, maybe more). Then the Spanish arrived in the early 1700s. Next were Mexicans and Anglo-American pioneers. 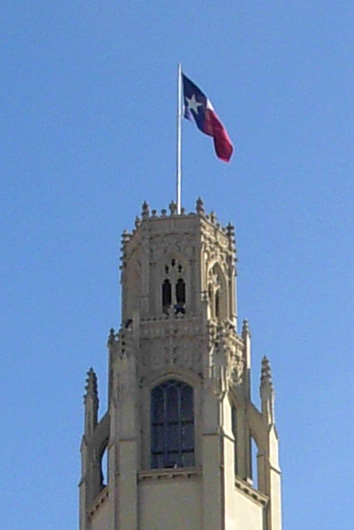 After Texas became a state in 1846 numerous Germans and other Europeans settled here, too. Each culture has left its mark, presenting a smorgasbord of interesting architecture (and food and festivals and ideas) that we found delightful. I thought it would be mostly a farmer's market, but there are also restaurants and numerous specialty shops (El Mercado) with everything from cheap imported trinkets to expensive art. 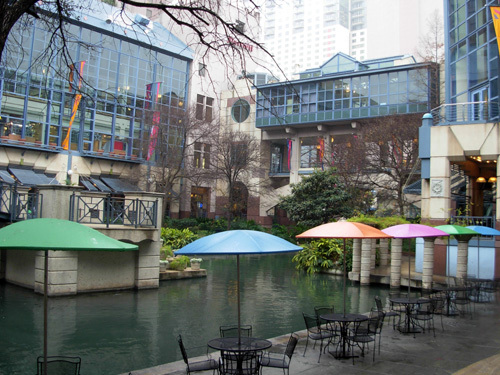 Here are a few more interesting buildings downtown that I photographed when we were walking around or boating along the River Walk. 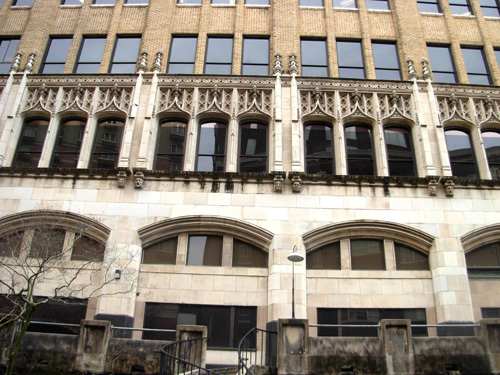 They illustrate the wide variety of architecture in the downtown area. I don't know what they all are. 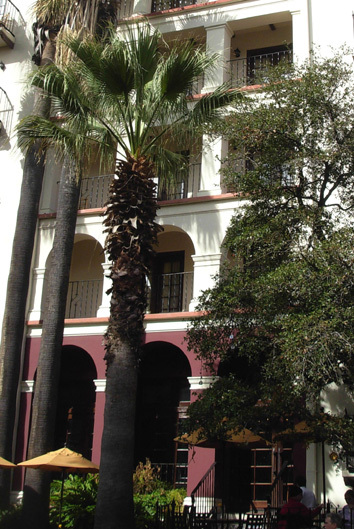 This building looks Mediterranean, or is that just because of the palm trees? 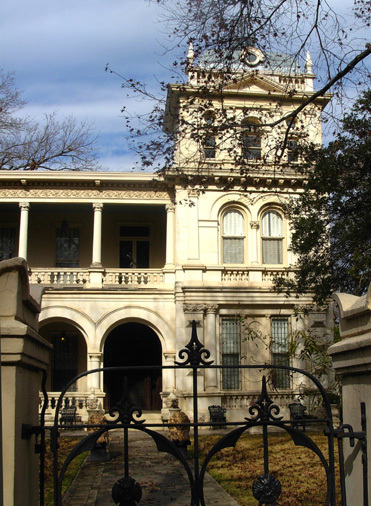 Now let's tour one of the city's historic residential districts. 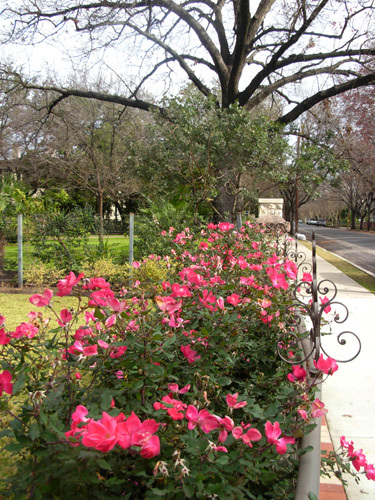 We saved our walking tour of this beautiful neighborhood just south of downtown San Antonio for a warm, spring-like morning. 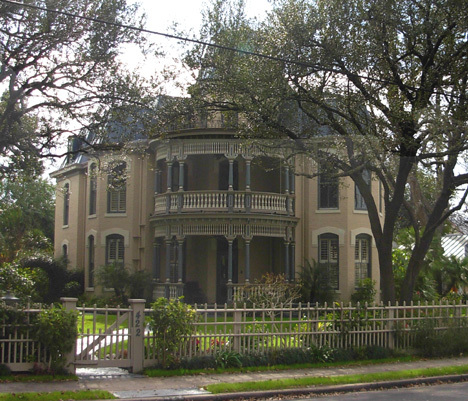 It reminded me of walking through Charleston, SC, Savannah, GA, New Orleans, LA, and other charming old neighborhoods full of interesting homes, lush foliage, and colorful flowers -- even with no leaves yet on some of the trees. The fact that it was January and most of the country was in a deep-freeze made it all the more delightful!! 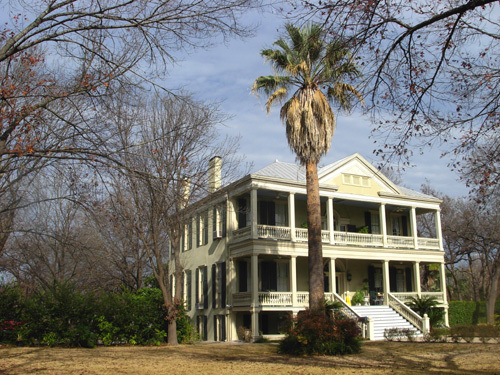 "The King William District occupies land that was once irrigated farm land belonging to the Mission San Antonio de Valero, the Alamo. 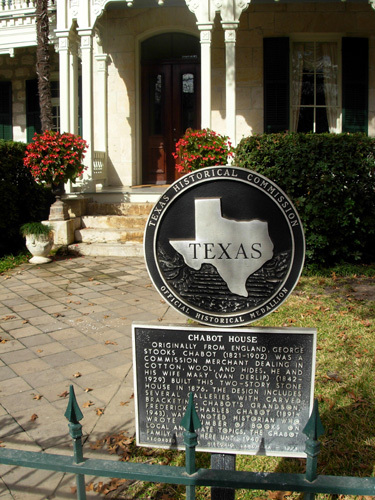 When the mission was secularized in 1793, the lands were divided among the resident Indian families from the mission or sold at public auction." 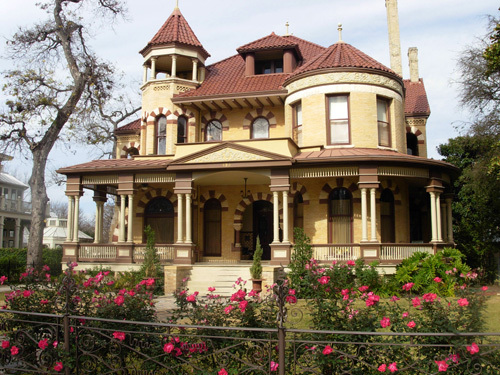 Italianate Victorian architecture of the Norton-Polk-Mathis House built in 1876. 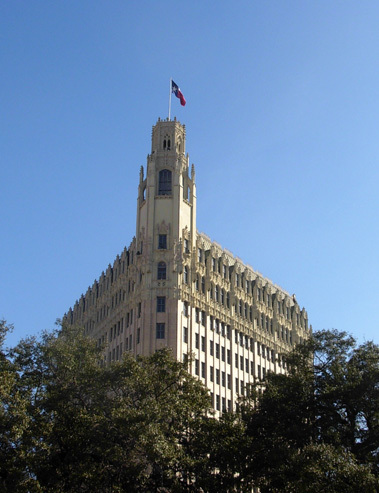 The Beaux Arts tower was added to the third story a few years later. 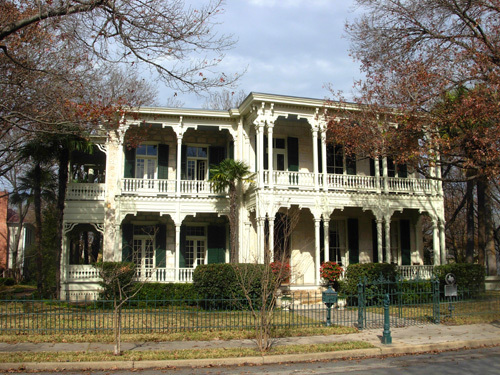 "The area called the King William Neighborhood of today was subdivided into lots in the 1860s and laid out with the present streets. 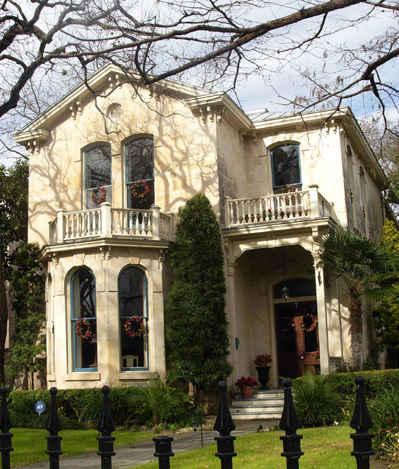 It was about this time that a great many Germans who had immigrated to Texas in the 1840s began to settle in this area and it became known as 'Sauerkraut Bend' to the rest of San Antonio." 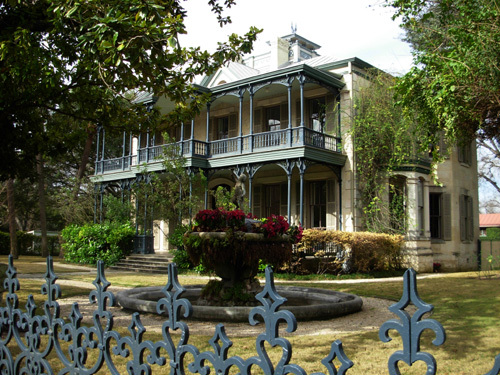 "It developed into an idyllic neighborhood of large, impressive houses shaded by enormous pecan and cypress trees. The main entry street into the area was given the name King Wilhelm in honor of King Wilhelm I, King of Prussia in the 1870s. During World War I, when America was at war with Germany, the name was changed to Pershing Avenue. A few years after the war was over the original name was restored, but this time it was given the English version of the name, King William, and it has remained so since." 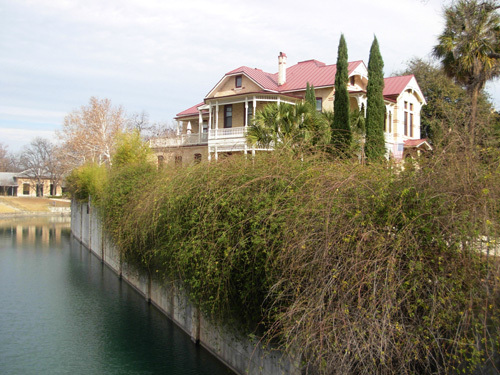 "In the early 1900s the King William District began to wane as a fashionable neighborhood and by 1920 many of the original home builders died and their children moved to other parts of San Antonio. 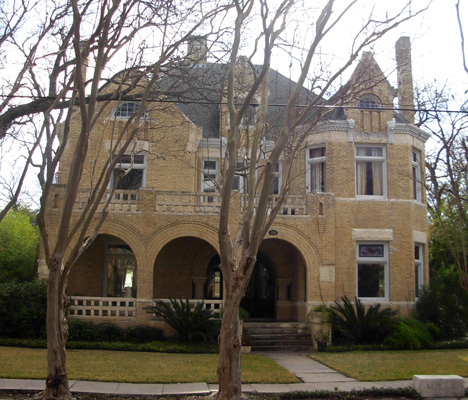 During the 1930s and 1940s the neighborhood declined and many of the fine old homes were converted into apartments and general deterioration set in throughout the area. Only a few of the earlier settlers remained and maintained earlier standards." 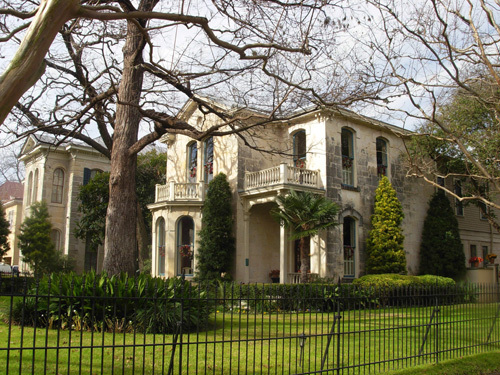 "Around 1950, however, the area began to attract a group of people who found its proximity to the business district attractive and who, moreover, recognized the potential of restoration of the fine old houses and the smaller cottages here and there. The interest in preservation of the area began to be aroused and once again it became a 'fashionable' and desirable place to live." That was fun! 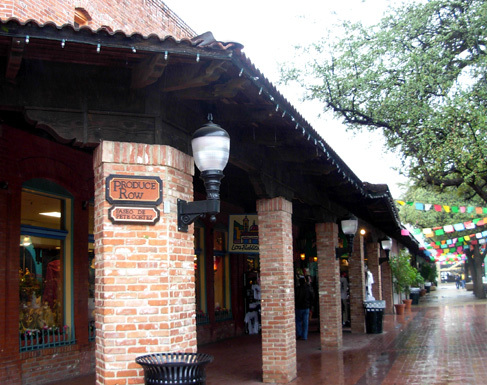 Now let's go see some really old buildings in San Antonio . . .